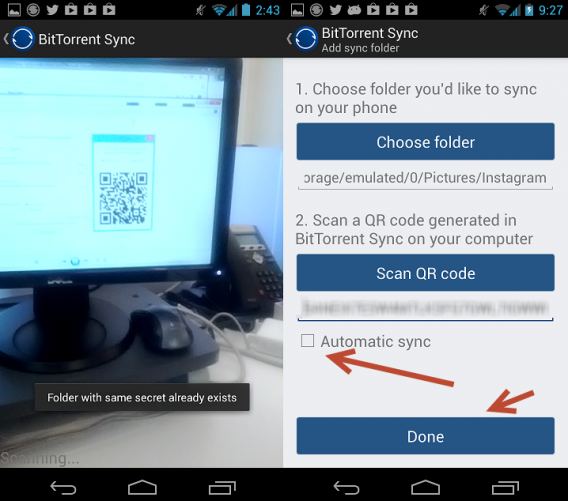 An Android version of BitTorrent Sync released recently, supporting Android 2.2 and later. Though still in beta, the mobile version allows users to sync between phones and Windows/Mac or share among Android devices. To gain the full effect of the Android app, you’ll also need the corresponding Windows or Mac versions. While BitTorrent Sync doesn’t have all the features of Dropbox and Google Drive, it’s a quick and easy way to share files across devices. We’ll show you how to use BitTorrent Sync for Android to transfer files from mobile to computer. When you first open the app you’ll need to add folders to be synced. Select the add folder icon at the top bar to be taken to a new screen. Hit the “Choose folder” button and select a folder on your Android. 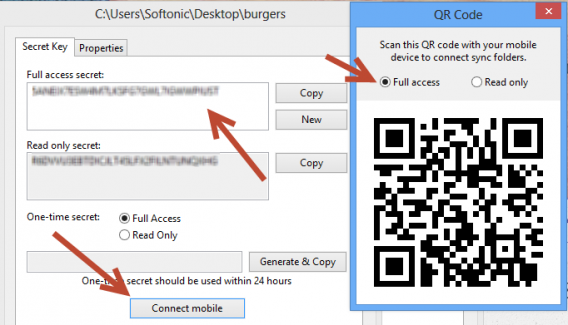 Now you have two options for syncing files with your computer: either scan a QR code or type in the secret manually. In either case, you’ll need to switch over to your desktop version. Within the “Folders” tab of BitTorrent sync on PC/Mac, right-click on one of your files and enter “Preferences”. You can copy the code manually to sync files, but a faster way is to hit the “Connect mobile” button. This will display a QR code that can be scanned with your Android phone. Back on your mobile device hit the “Scan QR code” button. This will switch to the camera, which you simply need to point at your monitor containing the QR. There’s no need for confirmation, the scan will complete as soon as the QR is in focus. When the secret has been scanned or manually entered, you can choose to toggle automatic syncing. Once you’re satisfied with the settings, hit the “Done” button to finish adding the folder. Once a folder is made and shared, tap on it to see the contents on your device. You can also switch to the “Remote” tab and see which files have not been synced (typically when you have opted out of automatic or have not a recent stable connection). Select the files you wish to download and hit the “Download” button. While the previous walkthrough is best for transferring files to your device, generating keys is a faster means of sending Android files to your computer. Hit the “Backup” tab and add a folder, much like you did previously. This time a secret key will be directly generated. You have the option of copying it to your device’s clipboard or, even better, you can email it via an installed email client, such as Gmail. Once you have the secret key, copy it and paste it into the “Full access secret” or “Read only secret” box within the Windows/Mac’s preferences tab. 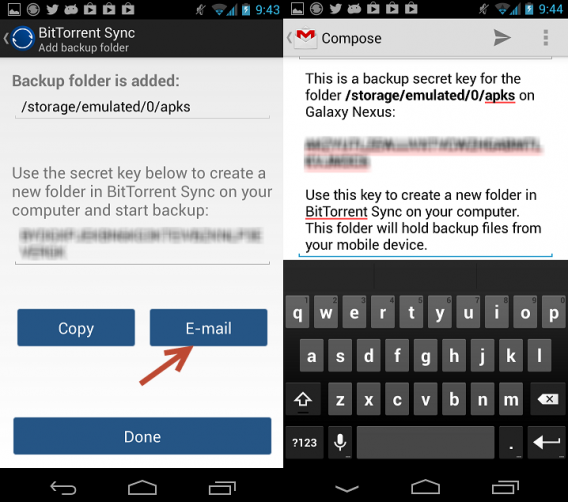 If you have two Android devices you can use the “Send” functionality to quickly transfer files between two devices. On one device tap “Select files to send” under the “Send” tab which will allow you to explore your folders and choose the files you wish to send over. There is even an option to filter only pictures. This will generate a QR code. On the other Android device, select “Receive files” to once again switch to the device’s camera. Scan the QR code and the transfer will complete, depending on your connection speed and size of the files. 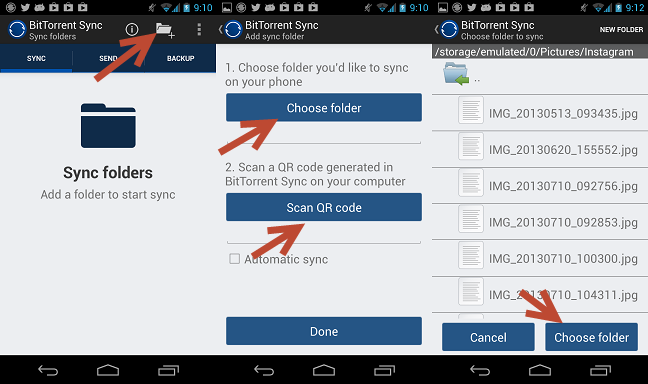 The Android release of BitTorrent Sync is a great means of quickly transferring files between phone and computers. It’s a great way to move photos, music, and movies around and have access no matter where you are. 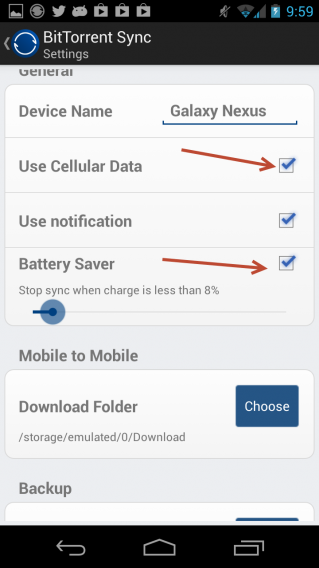 It’s worth noting that syncing can cause quite a bit of data use and drain your mobile battery. If you’re going to sync large numbers of files it might be a good idea to do so when you have access to Wi-Fi and a power outlet. That said, there are options in the settings menu to help alleviate this, such as turning off data or turning on the battery saving option to prevent unwanted syncs. Sync is still in beta and we look forward to the changes and improvements BitTorrent will release in the future.